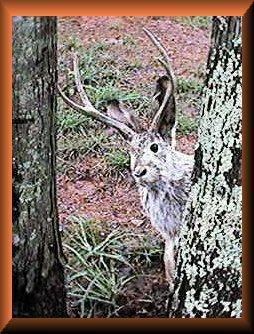 Who Says Jackalopes don't exist? Read more about me on the Wildlife page! 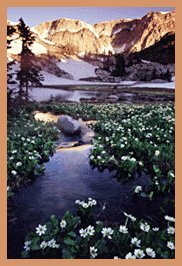 The focus of these pages are on Carbon County, Wyoming...located in the South Central part of the State; my home and native land. Carbon County, appropriately enough, is rich in deposits of coal, natural gas, crude oil, and and various minerals and ores. She is home to precious stones as well; jade, gold, and diamonds. The Political Seat of the County Government is located in Rawlins, a "City" of some 9,300 kindly folk, located on Interstate 80 in the South Central part of the Cowboy State. 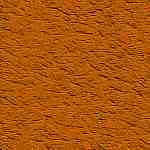 Click to go to Rawlins: Home on the Range Other communities in Carbon County are: Saratoga, Encampment, Riverside, Centennial, Sinclair, Hanna, Elk Mountain, Baggs, Savery, Dixon, and Medicine Bow. I will try to accumulate as much information as possible on these communities, and add that here. Please come back often to check on the new information from time to time. These pages will present to you the Facts of Carbon County, along with the Fiction surrounding her. Carbon County is rich in History of the Old West, and the tales and lore of those times gone by will be available for your perusal here. 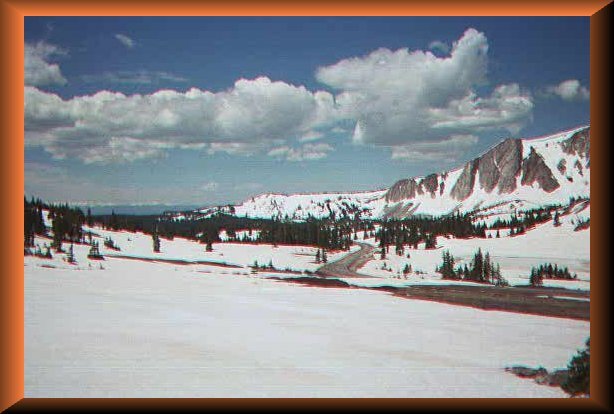 The Snowy Range (Medicine Bow Mountains) are absolutely breathtaking and are a must see if you are traversing Carbon County! 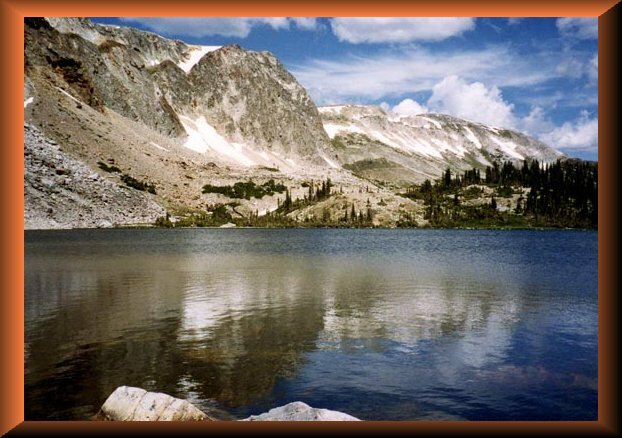 Medicine Bow Peak, shown in the photos above and below, is the highest point in the Snowies, reaching an elevation of over 9000 feet. John Denver said he "has seen it raining fire in the sky"...and..."wouldn't he be a poor man, if he never saw an eagle fly! "....He must have been talking about The Snowies when he wrote that song, for the sunsets are simply magnificent! Because of the elevation, it is safe to go one step further and say "I have seen in SNOWING fire in the sky..."....I have been fishing on Lake Marie and it's Sister lake just over the knoll in the top photo, Mirror lake, and have seen it snow in June, July, and August...virtually, every month of the year! Welcome to the High Country, Flatlander! This is no place for the Greenhorn or the cold blooded. 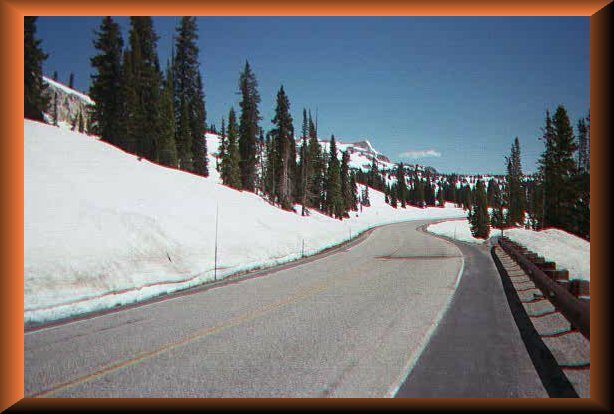 It takes a stout hearted person to love and appreciate the Mountain Grandeur of the Snowy Range! 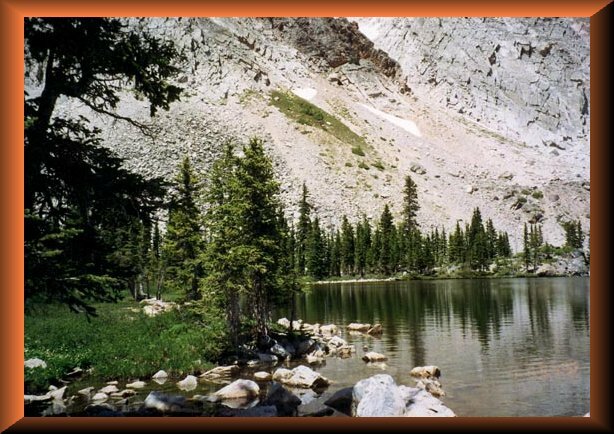 Below, is a photo of Medicine Bow Peak. Her top is crowned year round with a cap of white! Medicne Bow Peak is pure granite. In the 1960's, an ill fated flight from Denver enroute to Salt Lake City, ran into some bad weather over Medicine Bow Peak and, flying too low, slammed into her sides, killing all those on board the aircraft. The oil marks from that plane can still be seen today near the top of the mountain. So, sit back, kick off your cowboy boots, pour yourself a cup of coffee, light the fire, kiss the wife and kids, and relax and enjoy your visit to "Wyoming: Carbon County Facts and Fiction"! Please sign my guestbook or feel free to contact me via email with any questions and/or comments at the email address below. Please visit ARTJOZ..The Wyoming Catholic Connection, my other Homepage! Great information on The Catholic Church in Wyoming! These Pages have been Awarded Lydia's Award for Website Excellence! Lydia's Homepage...A Beautiful tribute to the Love of God!